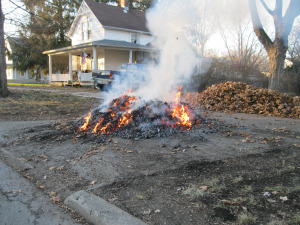 Leaf Pile - Burn or Compost? 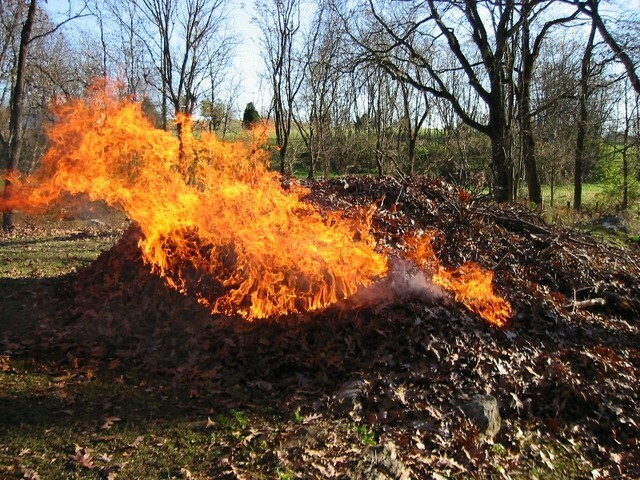 Burning leaf pile. Click on photos to enlarge. Yankee Candle has scented candles that go by 'Autumn Leaves.' A company named CB Experience makes a Burning Leaves perfume. Another has a product called Bonfire. Reviews are mixed - some describe the perfumes as having a liquid smoke or barbecue odor, with too-sweet overtones - while others reminisce on memories of camping trip fires or the childhood smells of burning leaves as an integral part of memories of fall. Mind you, the smell of leaves burning is not the same as wood smoke. Leaves have a higher moisture and tannin content compared to seasoned wood, so the experience is smokier and more astringent, although not necessarily acrid unless the pile is wetter than it should be. Per that state law, Massachusetts does not allow leaf burning at any time. Ditto grass, hay or stumps, or pressure-treated wood, or any wood with paint, or construction debris, the reason being that these fuels do not burn as cleanly as brush, branches and trees. As to why open air burning has become a no-no, when plant material is burned, much of it is converted to water and carbon dioxide. These are not local pollutants, although the latter contributes to global warming. However, incompletely combusted material becomes carbon monoxide, smoke and ash - all dangerous to people with asthma or other respiratory diseases. Too many leaf fires on a still air day will reduce visibility, resulting in a higher risk of car accidents. People will smell smoke and call police/fire responders, wasting their time on false alarms. More seriously, flyaway embers can cause forest and house fires. Two leaf composting containers, plus dirt pile to layer into the new leaves. away every other year to a commercial composting center. If not to burn, what? Composting on your own property works, but it means dedicating part of the yard to this unsightly process. 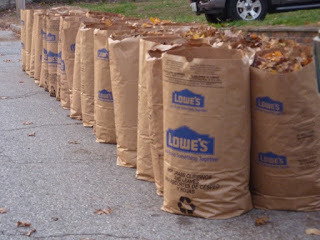 Consider hiring a yard clean-up service, either for an annual fall rake-out, or year-round mowing and maintenance. What they haul away ends up either in landfill or composted. 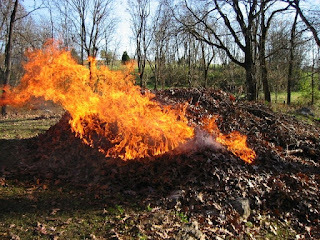 What you should not do is dump leaves and yard waste in the woods behind your house, as A) not your property, and B) you will be creating a fuel pile for a forest fire that could threaten yours and others' property. 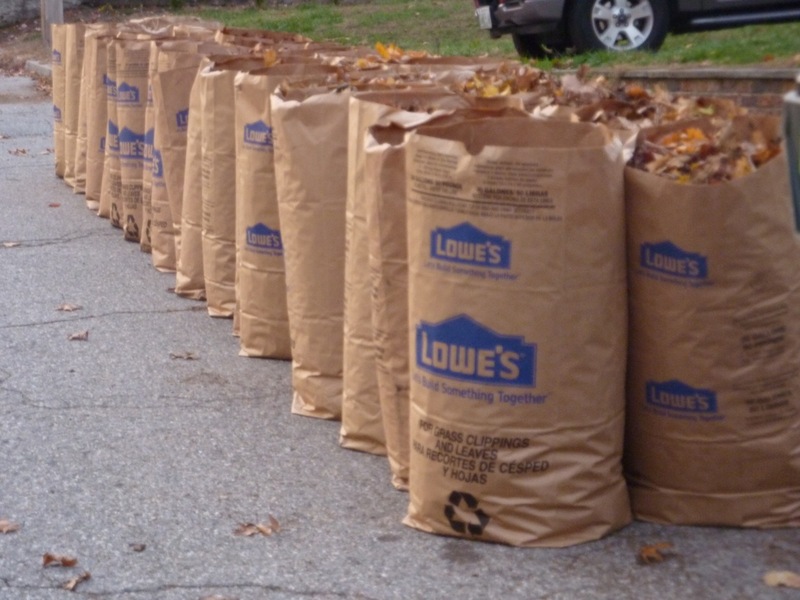 For Maynard, all those thousands and thousands of bags of leaves and sticks left curbside last month were hauled away by E.L. Harvey & Sons via a town contract. According to the Harvey & Sons website, the company is a full service waste hauling, transfer and scrap recycling operation, founded in 1911 by Emory Larkin Harvey and existing this day as a fourth generation family owned business. no truth to the rumor that the bags are made from leaves. Our yard waste is trucked to their headquarters site in Westborough, MA, where it is composted to become topsoil. The process involves shredding, mixing with a nitrogen source such as manure, grass clippings or previously composted soil, dampening with water, then using huge front-end loaders to turn/mix the piles about once a month. This routine keeps the oxygen- and water-requiring bacteria happy, and results in 100 cubic yards of leaves being converted into 25 cubic yards of compost in 10-12 months. The process generates so much heat that it continues all winter. By the way, calling the season "fall" came about in Britain in the sixteenth century, and refers to the observation that this is the time of year that leaves fall off trees. Really. Prior to that the season was autumn, borrowed from France (automne) and stemming from the Latin, autumus. Or else just referred to as "harvest." Of the season names, summer and winter go back more than 1,000 years, whereas spring and fall, date to half that.